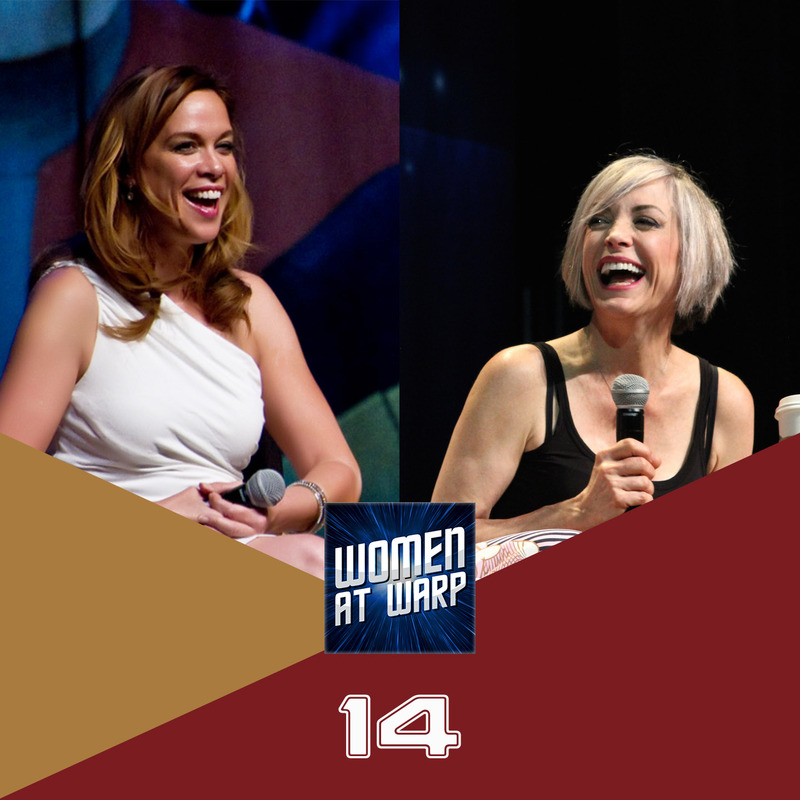 Interviews with Chase Masterson (Leeta) and Nana Visitor (Kira) from Star Trek: Deep Space Nine at Star Trek Las Vegas 2015. We talk about their DS9 characters – how they developed and challenged gender roles, as well as favourite scenes, community work and current projects, including Nana’s dream to have a play with Rene Auberjonois as a talking cat! Chase Masterson on community work (via HiveMindCentral). Photo Credit: Photo of Chase Masterson by Beth Madison (_DSC3462-1Uploaded by Rosenzweig) [CC BY 2.0], via Wikimedia Commons. Photo of Nana Visitor by Jarrah Hodge, all rights reserved. Re Kira/Odo: While I certainly identified strongly with Odo in his unrequited passion, I was ambivalent about it actually working out, BUT…one of the really GREAT things about the Kira/Odo relationship when it became romantic was that we got to see Kira, on at least two occasions, being totally and utterly selfless and non-possessive, simply letting Odo be free to do what he felt he needed to do, which (as with Rom and Leeta being the happy couple) is another thing we very rarely see in drama, as jealousy and dependence plays much better for conflict. It was something unexpected (in any character) and yet completely right for Kira, who had demonstrated that selflessness in so many other situations. Great episode! I really agree with Nana’s comments about Kira’s pregnancy and her relationship with Odo. I think for Kira, someone who is so emotional, it would have been fascinating to see what her feelings were having to give up the baby she brought to term. With regards to her and Odo, when I first watched the show I liked that they got together just because I like those two characters so much. But looking back I don’t think the romantic relationship really added anything that they didn’t already have as friends. Even that scene at the end of “Chimera” where Kira tells Odo she’s sorry if she ever made him feel he couldn’t be himself could happen with them being just friends. I agree with you all that we don’t get many male/female friendships, although I disagree with the comment about Sisko and Dax for two reasons. 1) I think they had a lot of scenes that established Jadzia and Ben’s friendship and 2) even if it were simply Curzon that he was friends with, the person the audience sees and the person he’s actually interacting with is a woman (minus the symbiont); that’s the friendship that we see played out. I’m sure I’ll come back and comment more since Kira Nerys is my favorite character ever. Great job with the Nana Vistor interview! Loved listening to her talk about her time on the set and her friendship with Rene. Odo and Kira are my fav Trek characters and even though I know some people weren’t crazy about them exploring a romantic relationship, I absolutely loved it. You did an amazing job with those interviews and I love to get those insights about both of their rules. In Star Trek Enterprise there was one episode called “Cogenitor” in season 2. It deals with an alien race that has 3 biological sexes and a very problematic culture around that. Now, I will not decide how this episode deals with these problematic topics and how the story goes around that. It might be absolutly terrible. But still, this episode is clearly intended to deal somehow with this topic and I am convinced that this is worth discussing. Either why it is good or bad, what should have been done differently and so on. Anyway, whatever topic might come up, I am eager to listen to more of your thoughts! Loved the interviews! Like Chase, I wish Leeta could have gotten a little more screen time and development. Backstory would have been great – I’ve always wondered what Leeta’s life was like during the occupation, what happened to her parents, how she ended up working at Quark’s, things like that. I also would have loved to see Kira and Leeta interact more, maybe even talking to each other about their pasts. They obviously have very different lives but they both grew up during the occupation and probably had some similar experiences, and I wish the show had explored that. Kira Nerys is my favorite character in Star Trek bar none, and it was so wonderful to hear Nana’s thoughts about her. I love the relationship between Kira and Odo, and even though I do ship them I don’t think I would have minded if they hadn’t turned romantic, as long as the emotional intimacy they had remained a focus of the story. One of my favorite things about them is their shared past, and the way they had such an impact on each other even before they became friends. They know each other so well and respect each other so much, and their interactions were generally a highlight of the show for me. As for the discussion about male-female friendships on DS9, I disagree with the comment about Sisko and Jadzi. Jadzia has Curzon’s memories and kind of inherits some of his interests, but based on what we hear about Curzon she definitely has her own separate personality. I think her relationship with Sisko does grow into something different from his friendship with Curzon, particularly after the first season. I also think you overlooked the friendship that develops between Sisko and Kira. They clash a lot when they first meet, and their personal relationship is complicated by the fact that Sisko is a major figure in Kira’s religion, but they continue to grow closer throughout the show and develop a great deal of care and respect for each other.